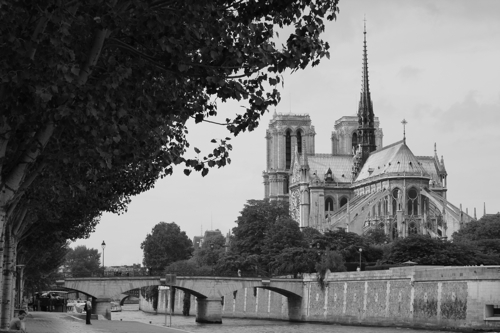 Why should you visit Notre-Dame? Becaue ten million other people do it every year? No, honestly, for me that would be more like a reason to go the long way round. 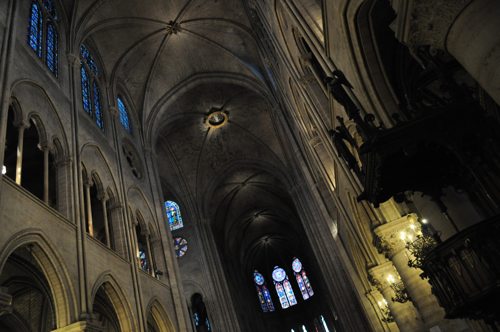 Notre-Dame is actually the most visited sight in Paris, way ahead of the Eiffel Tower. Should you go in spite of that? 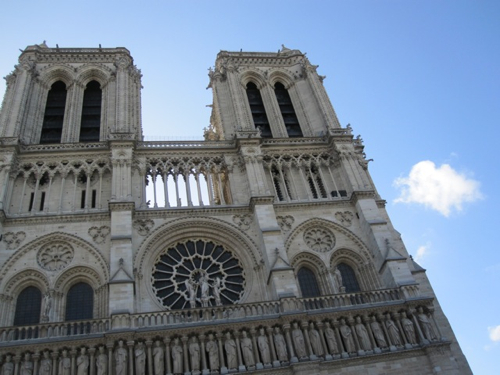 I’m afraid that yes: Notre-Dame is a masterpiece of French Gothic architecture and definitely worth a visit. But let me tell you what: Don’t go with the other sheep. Or do you really like to queue up even to get in? Do you really want to be in the middle of the hordes not respecting any basic rules? People take photos as if they are being paid for it, they film each other, they send text messages – which is something I wouldn’t complain about, because it’s quite discreet compared to the sound when their mobile phones actually start ringing. It all looks a bit like the Oktoberfest, not like a place of worship and contemplation. But it’s easy to avoid the masses, just don’t come during the rush hours. Every morning at 8, on Sundays at 8:30, there is a mass held. Walk in, sit down, listen. You still have the time to visit the cathedral afterwards. After all you didn't have to wait to get in. The cathedral was commissioned in 1160 by Bishop Maurice de Sully who obviously was a bit jealous of the abbey that had just gone up in Saint-Dénis. He wanted to do better and bigger. And apparently he didn't need to care about budgets and estimates. It took more than two hundred years to finish it. Although finish is not the right word. Throughout its history Notre-Dame has grown and changed, has been modified and even plundered, like during the French Revolution when the house was rededicated to the cult of Reason. At one point they even wanted to pull it down. It is thanks to Victor Hugo, at least partially, that it didn’t happen. With the enormous success of his novel Notre-Dame de Paris he launched the Gothic fashion and led the campaign for restoration. It was Viollet-le-Duc, a genius, who restored Notre-Dame in the mid 19th century. 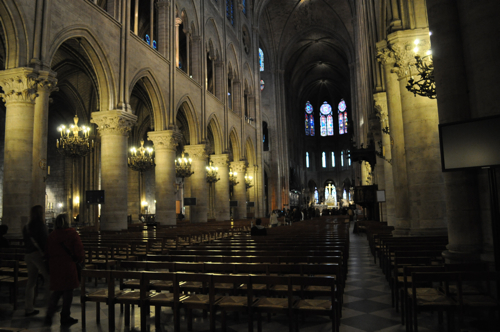 I can’t help myself, but I really get the impression of feeling the long and eventful history of France inside of Notre-Dame. There is a special density, spirituality. All that might sound banal in the ears of a religious person, but the thing is that even the unbeliever feels something different inside these walls. Napoleon crowned himself emperor here in December 1804. There were, at this time, no photographers and no mobile phones to immortalise the moment, but there was the painter David. Have a look at his Coronation of Napoleon in the Louvre and you’ll get an idea about how grandiosely Napoleon staged his megalomania. The choir of the cathedral in his painting actually resembles a theatre stage in which each actor has his place amidst the grandiose scenery. Once inside, you have several options: You might like to study the spectacular rose windows. The most famous is the one above the pipe on the western side (restored by Viollet-le-Duc) showing the months, the signs of the zodiac, virtues and vices, the prophets and, in the centre, the Virgin. The northern one has remained virtually unchanged since its creation in the 13th century. Why not visi the trésor, the treasury, with its impressive liturgical objects and relics, although their origins sometimes are quite dubious. However this is certainly not the case for the Sainte Couronne, the Holy Crown, a wreath of thorns, which Jesus carried on his head when he was crucified. If you do have any doubts, well, check it out, but prepare yourself to wait a bit: this treasure is only exhibited once a month, on the first Friday of every month from 3 pm to 4 pm. 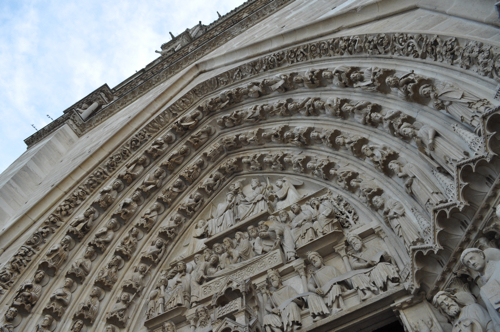 My favourite thing is to visit the tours de Notre-Dame. I’ve always wondered as I stand in the queues if it is really were worth queuing up for such a long time. I have to confess: it is. After having walked up the 422 steps (it’s actually a medical examination…), you feel a bit like the Hunchback of Notre-Dame (or Esmeralda), you can shake hands with the gargoyles and enjoy one of the most beautiful views of Paris. Actually, it’s not one of the most beautiful, it’s the most beautiful. Notre-Dame is a special place. It’s the heart of Paris, if not of France. At the far end of the Place du parvis you’ll find a spot, a circular stone and bronze plaque that marks the point zero: The distance to Paris from all part of France is calculated from here. Do you know what that means: you can’t come closer to this mysterious, gorgeous and incomprehensible thing called la France.